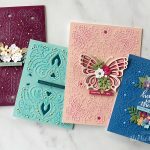 Designer Note: By embossing and stenciling through the dies, it will add the impression of dimension without the bulk of extra added layers. 1. Cut/emboss one (1) Sweet Baby pram, bottle, heart and rattle using Cuddle Cream. 2. 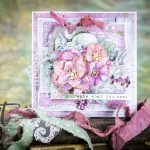 Use the Die as a stencil, sponging inside the Die using Rose Bud and a Blending Tool. 3. Sponge London Fog on the inside of the wheels and leave the bottle itself ink free. 4. Cut/emboss one A2 Filigree Delight frame and oval using Cuddle Cream. 5. Stamp the oval using the background stamp and Rose Bud ink. 6. 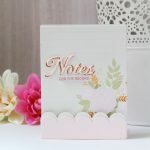 Adhere the A2 Filigree Delight to a pre-cut white card base using liquid glue. 7. Pop the Oval up on 3D Foam Squares. 8. Adhere the Diecut embellishments to the right side of the card using double sided tape, popping the heart with a 3D Foam Square. 9. Adhere the Pram to the stamped Oval using 3D Foam Squares. 10. Cut/emboss a Bird Banner using Cuddle Cream. 11. Sponge round the edges using Rose Bud. 12. Adhere across the lower portion of the Oval; popping up each end using a 3D Foam Square. 13. Stamp the sentiment using Rose Bud, hand-cut and adhere across the Bird Banner. 15. Adhere a small Mulberry Paper Rose. 16. Adhere small pink pearls around the Filigree frame as desired. 17. Apply irRESISTibles in Shimmer to the heart embellishment and pram as shown above. Thanks so much for stopping by and the comments you leave – each one is read and appreciated!